With butterfly pot for hair bands and clips.No more knots and tangles...no more tears! 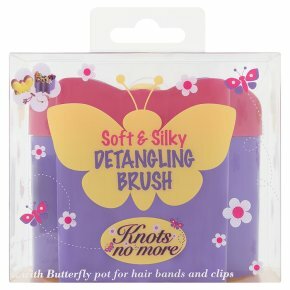 The Knots no more detangling brush has been carefully designed with special flexible bristles that effectively comb through the hair to detangle and smooth the hair's cuticle in an instant, leaving it soft and silky smooth. And the keepsake butterfly pop is perfect for bobbles, clips and hairbands. Directions: For use on wet or dry hair. Start at the roots and comb through to the ends. For best results, use together with Knots no more detangling shampoo and detangling spray.